U.S. rail traffic increased 8.1 percent to 530,299 carloads and intermodal units during the week ending Jan. 21 compared with traffic during the same week last year, the Association of American Railroads (AAR) reported yesterday. Total U.S. carloads for the week jumped 10.7 percent to 262,496 units, while intermodal volume climbed 5.8 percent to 267,803 containers and trailers compared with traffic during the third week in 2016. Eight of the 10 carload commodity groups that AAR tracks every week posted increases compared with the same week in 2016. They included coal, up 22.4 percent to 90,786 carloads; grain, up 16.3 percent to 24,485 carloads; and miscellaneous carloads, up 12.7 percent to 10,052 carloads. Commodities that logged decreases included petroleum and petroleum products, down 17.7 percent to 10,217 carloads; and forest products, down 5 percent to 9,726 carloads. Canadian railroads' carload traffic soared 16.2 percent to 79,951 units, while intermodal volume rose 7.2 percent to 63,635 intermodal units. Mexican railroads bucked the trend in 2017's third week, however. They reported 16,641 carloads for the week, down 4.5 percent compared with the same week last year, and 11,405 intermodal units, down 0.9 percent. For the first three weeks of the year, U.S. railroads reported 1,487,945 carloads and intermodal units, a decrease of 0.5 percent compared with the same period a year ago. 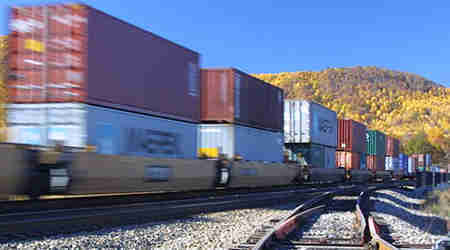 Canadian railroads reported cumulative traffic of 400,755 carloads, containers and trailers, up 4.9 percent. Cumulative volume on Mexican railroads during the three-week period was 73,148 carloads and intermodal containers and trailers, down 10.5 percent from the same point last year.